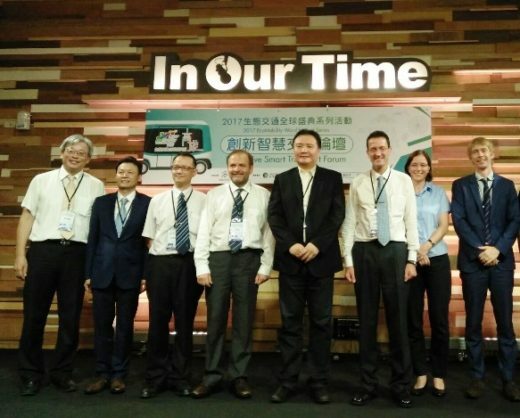 The iCity iCare Forum on Smart Transportation and Policy Design was organised by the ECCT's Low Carbon Initiative (LCI) together with the Kaohsiung City Government. The event, held in Kaohsiung, served as a prelude to and promotion of the forthcoming 2017 Eco-Mobility World Festival, to be held in Kaohsiung in October this year. 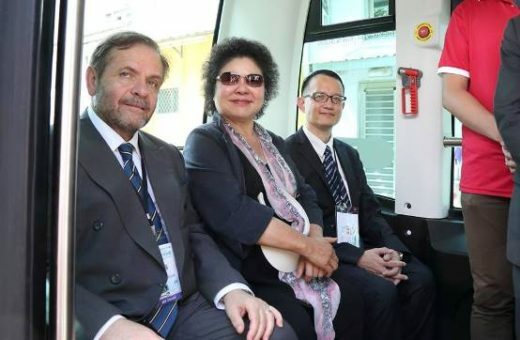 Immediately prior to the forum Kaohsiung Mayor Chen Chu and other VIP guests took a ride in an autonomous minibus and held a press conference to introduce the minibus. Kaohsiung is the first city in Taiwan to start trial runs of an autonomous electric minibus. At the forum after the press conference opening remarks were made by the guests of honour, after which the speakers gave presentations in two sessions covering various aspects of smart transportation. Each session was followed by a Q&A session. The guests of honour who made opening remarks were Hsu Li-ming, Deputy Mayor, Kaohsiung City Government; Dr Wang Mu-han, Counselor and Director of Office, Science and Technology Advisors, Ministry of Transportation and Communications (MOTC) (who was also a speaker at the forum); Giuseppe Izzo, LCI Steering Committee & General Manager, STMicroelectronics Taiwan (who was also a speaker). At the conclusion of the forum, closing remarks were made by Dr Chen Ching-fu, Director-General, Kaohsiung Transportation Bureau, Kaohsiung City Government. 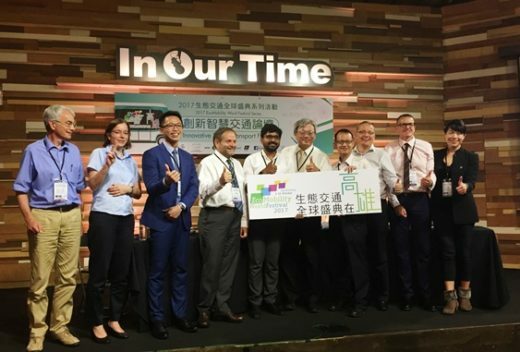 The other speakers at the forum were Sabrina Schmidt-Koschella, Deputy Director, German Institute Taipei; Jeroen Pynenburg, Local Product Group Manager, EV Charger Infrastructure, ABB; Willis Chi, Marketing Manager, Michelin Tire Taiwan and Santosh Kodukula, Ecomobility Programme Manager, ICLEI. The moderator of the first session was Konrad Otto-Zimmerman, Creative Director, The Urban Idea. The second session was moderated by Tim Berge, General Manager, International Community Radio Taiwan (ICRT). In his remarks Deputy Mayor Hsu Li-ming said that the Kaohsiung City Government, as a member of the EcoMobility Alliance of 22 major cities, takes the issue of environmental sustainability very seriously. Besides being the first city in Taiwan to use autonomous vehicles, the city is also a pioneer in using solar boats on the city's Love River. It is also leading efforts to make the public transport system more comprehensive, seamless and greener. In his remarks Dr Wang Mu-han made the connection between providing convenience and the best environmental options to the public. He emphasized the need for partnership between the public and private sectors in order to make progress not just for Taiwan but for the world. In his remarks Giuseppe Izzo said that it was exciting to see that Kaohsiung is taking the lead as the first city in Taiwan to start a trial run of an autonomous electric minibus. He noted that great advances are being made in autonomous vehicles every day but that the news headlines are usually about individual self-driving cars. "What this innovative example reminds us is that autonomous vehicles are already being used for public transport in many countries in Europe and elsewhere around the world. It also reminds us that increasing the use of public transport can make a big impact in reducing emissions," he said. In his remarks before the first presentation, moderator Konrad Otto-Zimmerman said that the "i" in iCity iCare could be interpreted to stand for several things, some positive and some negative. In a positive interpretation, it could stand for intelligence and innovation. In a negative interpretation, it could stand for irrelevant or irresponsive. His point, he went on to explain, was that when thinking about urban mobility, we need to consider both the potential benefits as well as the potential drawbacks of actions in order to make sure that action on eco-mobility is not just following a trend but also serves a useful purpose towards making real progress. The speaker summarized the German government's vision for smart transport and some of the policies it has implemented. She noted that the German government takes a comprehensive approach towards transport that gives priority to eco-mobility and sharing and that guarantees mobility while protecting the environment at the same time. The ultimate goal is zero emissions transport. However, she pointed out that there has been a 7% rise in emissions in the transport sector in recent years, [which runs counter to the advances being made in cutting emissions in other sectors such as electricity generation, buildings and industry]. In order to address the challenge, measures have been introduced including increasing electric vehicle (EV) recharging (e-charging) infrastructure, upgrading the rail and public transport network as well as bicycle and EV sharing. She added that the government had also missed its target for EVs. She made the point that even though the government is providing generous subsidies for EVs this will not be enough to encourage the shift to EVs. Additional measures, some of which will not be popular, such as higher taxes on fossil fuel vehicles, setting compulsory EV quotas for manufacturers and scrapping subsidies (such as those given to diesel vehicles) will also be needed. At the same time, EVs must be attractive to consumers, which means that they must be affordable and range anxiety must be addressed by making improvements to batteries and increasing the e-charging network. She admitted that it is easier to change the behaviour of younger consumers who tend to not care too much about having a car as a status symbol. While the switch to EV passenger vehicles is not too challenging technically, it is much more difficult for large vehicles such as trucks and other service vehicles. The German government's approach towards these vehicles is to switch to liquid natural gas or biofuels. Other measures the government is taking to reduce emissions in the transport sector include introducing legislation on smart traffic systems and promoting automated and connected driving. In this regard, a motorway test bed has been set up in Bavaria. At the same time the government is developing cyber standards aimed at preventing hacking of connected vehicles as well as protecting private data. On 1 September 2017 the government plans to introduce car sharing legislation which will give parking priority to vehicles that are being shared in various car sharing schemes. The speaker went on to introduce some best practices in Germany including smart parking Apps and vehicle sharing schemes. The speaker introduced Taiwan's ITS policies. A plan was approved by the Legislative Yuan earlier this year to identify and approve projects to be carried out from 2017-2020. IoT and the sharing economy should create many opportunities for Taiwan given the well-established IT industry, high internet penetration and proven ability to design and manufacture new products. The new plan emphasises 5 "Ss": safe, smooth, seamless, sharing and sustainable. A budget of US$100 million will be invested in development. Among other areas, the plan will focus on smart traffic, mobility as a service, safety, rural areas, connected vehicles and smart integrated corridor management. Testbeds will be established on the Taipei-Ilan corridor, eastern Taiwan as well as high density western areas for new technologies, including for autonomous vehicles. Among other targets the government aims to reduce accidents by 20%, congestion by 25% and increase the use of public transport by 10% as well as boost industrial output. In the Q&A session, Sabrina Schmidt-Koschella made the point that the transition to EVs is not just about persuading consumers. It also requires an overhaul of the car industry supply chain. This requires careful planning since it is a major industry in Germany that employs many people. The transition will therefore have to balance the interests of the industry and the environmental goals. Questions were also raised and discussed about the problem of a lack of recharging infrastructure and how to promote car sharing. In his presentation, the speaker likened fossil fuel vehicles to smoking, in that they are detrimental to health. To make the transition to EVs would need a similar approach to that taken towards smoking. He made the point that while some countries are phasing out fossil fuels out of concern for future climate change, in countries like China, where pollution has already reached critical levels, it is matter of necessity. By his estimates, the global car market (measured by annual sales) will rise from around 80 million currently to 120 million by 2040. Given the shift to EVs, this will require a huge increase in charging infrastructure. While most consumers in developed markets such as the EU and North America will have to make the transition to EVs, in countries like China, the first vehicle for most consumers will be an EV. Industry analysts' projections vary a lot but Pynenburg believes a conservative projection is that 35% of the entire car market (or about 40 million units) will be EVs by 2040, compared to only 0.8% at present. In his view 2018 will mark the tipping point towards of a rapid transition to EVs given the ongoing and rapid drop in battery prices. While some doubt the transition will be that fast given capacity constraints, this could change with a large increase in production capacity. The cost of batteries has already dropped by four fifths to about US$400 per kilowatt hour but this will soon fall to just US$100, according to estimates cited by Pynenburg. The current industry average range for an electric car is 250 kilometres (km) per charge. In 3-4 years this is expected to rise to 350km. ABB already has fast charging stations that can recharge a battery in 20 minutes. The main issue to overcome is not the technology but the business model. He went on to give examples of companies operating in Europe. For example, a company called Fastnet provides recharging service to consumers at recharging stations located next to highways. Their charging stations are powered by solar roofs and charging takes 20 minutes. The company's business model is similar to that of a phone company. Consumers choose their preferred package with monthly charges ranging from low cost and limited usage to unlimited usage for €99 per month. Modern tyres are safer and much more environmentally-friendly than previous generations and specifically designed for different types of new vehicles. Tyres are more fuel efficient because they are lighter and offer less resistance. They also last longer, which means they need to be replaced less often. They are also designed to be reused and regrooved. For example, truck tyres can be regrooved and reused several times. In addition, Michelin's production sites have been redesigned to reduce energy. The company is also planting rubber trees in Indonesia to absorb CO2 and also increase the use of natural rubber and thereby reduce the use of synthetic materials in its tyres. It is also looking to improve the materials it uses to manufacture tyres. By 2030 the company has an internal target to reduce its carbon footprint by 20% compared to 2010 levels. Smart driving and IoT have been identified by STMicroelectronics as areas of strategic focus. At present, half of the company's business is derived from the automotive sector. Given rising urban populations and increasing costs of personal vehicle ownership (the cost of vehicles and parking), an increasing number of urban dwellers are expected to switch from ownership to mobility on demand. Izzo cited predictions that by 2030 20% of car drivers will not own their cars and by 2050 there will be no car owners. This makes sense because, on average, cars are used for just one an hour a day. Taiwan is especially suitable for mobility on demand given that the cost of car ownership in Taiwan is higher than the global average (30% higher than Italy, for example). In addition, there are already 23 million vehicles in Taiwan, one for each person, which is not safe, convenient or efficient. Another factor to consider is that depreciation of vehicles in Taiwan is very rapid. Izzo cited McKinsey estimates which predict that by 2030 35% of vehicles will have significant safety features, 50% will be semi-autonomous and 15% fully autonomous. The key factors that will enable this shift are more computational power, artificial intelligence, mapping, GPS and sensors. The average car today has 200 sensors (some have as many as 400) and the number will increase with the advent of autonomous vehicles. Autonomous driving works easily in protected environments but a much higher level of intelligence is needed on busy city streets. Technology is advancing at a rapid rate. The industry is also changing. In future we can expect a lot of alliances between car companies and digital companies. The use of data will also change. A lot of data is generated by cars. At present this is not shared but in future this data could be shared and used in many ways to improve driving performance and services. We should expect a lot of different business models to emerge, such as car sharing schemes. Besides a huge growth in semiconductors, radar, LIDAR, cameras and sensors, autonomous driving will facilitate electrification and vice-versa. The speaker made the point that making transport smart is not just about technology but also requires smart planning and decisions on the part of city authorities. The most benefits in terms of health and mobility are realized when the first priority is given to pedestrians (walking), followed by cycling before public transport and shared vehicles. Individual vehicles should be the least privileged form of mobility. Most cities today still give priority to individual vehicles, which is why common problems such as congestion, air pollution and a lack of safety are still with us. Kodukula made the point that individual autonomous vehicles, even if they are electric and would thereby reduce pollution and be safer, would nevertheless give rise to the problem of "green congestion" if there are too many of them. This reiterates the point that autonomous vehicles are not a panacea and that cities need a comprehensive solution to mobility that prioritises the forms of mobility (as indicated previously) and includes a good public transport network. For this to happen, cities have to make the environment friendlier to walking and cycling. Kodukula stressed that cities should embrace technology but should consider not only the supply side but also the demand side. For example, Singapore has introduced road charging whereby drivers pay for the use of roads but the price varies according to traffic conditions. For example, it is more expensive during rush hour and cheaper in off-peak hours. Cities also have to change the way they look at parking. Free parking is equivalent to a subsidy to car owners. The solution is to make parking very expensive for individual owners and use the fees raised to subsidise public transport and make more parking spaces available for car sharing. In the Q&A session, speakers discussed the development of reusing EV batteries. It was noted that while EV batteries have a useful life of around five years in cars, the same batteries could be used in homes for another 20 years to store renewable energy. One speaker predicted that within five years there will be more batteries in homes than in cars.